Railpictures.ca - Stephen C. Host Photo: The Time Machine can be cruel, and this is just one example. This is, or was, Niagara Falls yard. The yard office is still there, the CN Police call out of this building as well as some MOW crew. That’s about it, and the two former mainlines that now run to the station, used now by VIA and GO. Freights? Well, do you see any? I don’t… Compare this to Arnold Mooneys shot from 1994 – taken from the exact same location, showing CN yard engines, fueling tracks, and curiously, a CP freight waiting to cross the bridge, as well as much much more. The Cyanomide plant is also now gone.. of course. His photo: here. – consider this my entry into the Time Machine. Might not be my last! | Railpictures.ca – Canadian Railway Photography – photographie ferroviaire Canadienne. Compare this to Arnold Mooneys shot from 1994 - taken from the exact same location, showing CN yard engines, fueling tracks, and curiously, a CP freight waiting to cross the bridge, as well as much much more. The Cyanomide plant is also now gone.. of course. His photo: here. - consider this my entry into the Time Machine. Might not be my last! Comparing the two shots truly saddens me. Merritton I remember very well, was born in 76. My parents place was on the escarpment edge, in winter you can still make out the Glendale crossing thru the tree line that has overgrown on the hill. Up until about 2001, you could see the trains over to West Lincoln coming thru from their place. I feel lucky to have seen the Merritton yard, the station, as well as the lines in Thorold back in the 80′s. I very much enjoy your contributions Mr. Mooney! Growing up in St. Catharines and near Merriton, I really wish I had seen this yard back in the 80′s. Was just in this area yesterday looking at this same spot, you wouldn’t know this was a busy freight yard at one time. 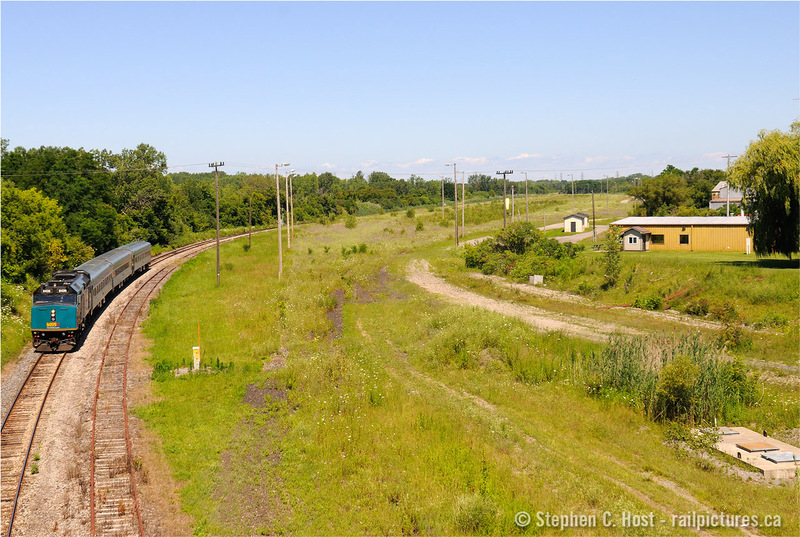 The Wabash/Norfolk and Western/NS ran to Niagara Falls Yard until around 2006-2009 or so – whenever NS 445 interchange was switched from NF to Fort Erie. Cabooses would have been until 1996 or so when NS went Cabooseless in Canada. I am fairly certain NF yard, as well as the Payne sub, and St Thomas yard facilities could not be removed until the end of the NS Joint Section which likely stipulated the yard tracks, buildings (with NS computers) and mainlines accessible by NS. Once the Joint Section agreement was terminated, the track could then be removed or abandoned as required, which is what has ultimately happened. One of my earliest offerings to this group showed a Buffalo Creek locomotive on the property. And, a center cab unit was stored there for a long time; I think Dofasco. Somebody was going to do something with it, but I don’t think they progressed past a sloppy paint job. This yard was a remarkable facility for many years……….just as Fort Erie was. And now all we have is Port Rob?? I remember when they had the GT caboose and the NW caboose that use to be in the yard all the time. The yard lights remain, how odd when there is nothing left to illuminate. They closed the yard many years ago and moved everything to Pt.Robinson. I remember running trains 448/449 in and out of that yard. Sad to see it gone now. Who knows, with all the new trackwork and stations they are building on the Grimbsy sub for the eventual expansion of GO trains, that empty yard may be rebuilt as a layover yard for GO/Metrolink. Why was the VIA running? Hard to believe there was a yard there at any point, except for the vast amount of empty space. I still look off the bridge when I drive over it, out of habit; but this image still is a shocker. Nice to catch a VIA special. Well done, Mr. Host. Forgot to mention…. this was a pan-am charter from Toronto, happened upon it by surprise at Grimsby and I was already headed to Niagara Falls for a family getaway. About 80 athletes got off at Niagara Falls for some tourism. Naturally, for those out of town, VIA powered trains are very rare, charters mostly, since only Amtrak runs to/from the falls. What a sad shot. Presumably there is much less local industry to switch?